Our Chief Executive, Dr Larry Marshall. I would like to begin by acknowledging the Ngunnawal and Ngambri people as the Traditional Owners of the land that we are on today, and pay my respect to their Elders past and present. Thank you all for being here today, and a special hello to CSIRO’s partners and collaborators in the room, we couldn’t deliver profound national benefit from science without you. I will note one of the faces missing today, our Minister, Arthur Sinodinos, and send him our best wishes for a speedy recovery. Today in Australia, we can reach customers anywhere on the planet, but our competitors can come at us from any direction & we may never see them coming. We are more connected to the rest of the world than ever before. Today our world is flat – but a flattened world comes at a cost: it makes it too easy to lie down. We used to be a nation of proud innovators, Aussie ingenuity created industries out of a barren landscape. But as we’ve become more connected to the rest of the world, our reliance on Aussie ingenuity has waned. Instead of pride in our powers of innovation, we’re now proud early adopters of solutions from across the seas. So today I want to tell you about a new chapter in your national science agency, a chapter written to solve these seemingly un-solvable problems – because that’s what science does. I’m going to talk to you about three changes at CSIRO: Speed; Market Vision; and Reinvention. Speed to take science off the lab bench and turn it into real world benefit at an accelerated pace, recognising the speed of change in the world around us. Market Vision to find the pivot in our national industries that will secure our advantage, before someone else beats us to it. And reinvention to realise the next leaps forward for each of our industries. CSIRO isn’t changing because science has changed but because in times of change it’s easy to forget that we’ve been here before. We’ve closed down old industries and we’ve created new ones. And the answers weren’t always obvious, but we knew where to start looking. Today, the word ‘innovation’ means something different to everyone. The most recent Australian Innovation System report highlighted this by defining two kinds of “innovation”. There’s “new to market”, when a business invests in their own novel products. Only 5.5% of Australian companies do this. Then there’s “new to business” innovation, which is just adopting someone else’s idea. 19% of Australian businesses copy innovation. The rate of Australian innovation has declined consistently since the Global Financial Crisis, making us no longer an innovation leader, but an innovation follower. It’s probably no surprise I’m a big fan of innovation. I was offered a bet of $50 not to say ‘innovation’ today and I realised in that moment, just how much of a buzzword it has become. Today I want to give you a few reasons to come back to science, to feel optimistic about our future, and perhaps to even get a glimpse of these ephemeral “jobs of the future” we keep hearing about. 100 years ago, a visionary Prime Minister – Billy Hughes surveyed the serious challenges facing a fledgling nation, and called for an organisation of scientists to re-shape Australia’s destiny. I’m deeply honoured to lead that organisation, our national science agency, the CSIRO – or sih-roh. Billy wanted what you want: solutions from science. That‘s innovation. We controlled pests like rabbits with myxomatosis and tackled flies with dung beetles. We re-invented industries like cotton and barley to give Australia an unfair advantage. And we transformed the world with breakthrough inventions like ultrasound imaging and fast WiFi. But today, Australia faces a completely different set of challenges: digitisation, automation, and globalisation. Once again, our people fear an uncertain future. And yet, the answers are right under our nose – and on our backs. Australian science is in your cotton shirt, and in your wool suit, and in the permanent pleat. It’s the polymer bank notes in your wallet, and the wireless in your phone. You’re seeing the world through extended wear contact lenses, watching an ultrasound image of a baby yet to be born – and when they are, they’ll be wrapped in a wool blanket washed in Softly. So why should we look to science? Because in every recession, in every revolution, in every major shift of an economy around the world – science has created the new industries that emerged from the turmoil, and those new industries created new value that grew the economy. Those science enabled industries – created the jobs of the future. That’s the power of science, that’s why CSIRO is here. Let me take you out of this luxurious air-conditioned room, far away from all this technology, far back in time, back to Australia’s beginnings. Australians have historically been phenomenal innovators, going all the way back, at least 65,000 years: from rendering poisonous seeds edible, to the aerodynamic genius of the boomerang, to the environmentally attuned practise of ‘firestick farming’, which still informs CSIRO’s controlled burning practices today. Australia’s first people invented incredible breakthroughs to support life down under. Even as Australia became more connected to other nations, we took pride in our own ingenuity. In fact, let me tell you briefly about one invention that was masterminded not in isolation to the rest of the world, but right under its very nose. In the 1940s and 50s, the textiles industry was disrupted by synthetics, most notably the invention of polyester. Australia’s wool industry had to respond – but the process of spinning wool into fabric hadn’t changed in more than 200 years, since the ‘spinning jenny’ was invented in England in 1764. Then one wet Wednesday in February 1961, CSIRO physicists David Henshaw and Gordon Walls unravelled the challenge that had tied their peers up in knots. Instead of reinventing the spinning process, they reinvented the wool itself. They called it self-twisting yarn, created with a new kind of machine. The pair were given a shed with a workbench, hidden at the back of the crowded CSIRO buildings in Geelong where they secretly tinkered with the new machine. They formed a partnership with Repco and built six machines, all hidden out the back of the Geelong site. The team wore suits made from the new yarn, which none of the experts in their building realised – nor did the hundreds of overseas textile experts visiting the site. The Prime Minister, Sir Robert Menzies, was given Clan Menzies tartan curtains for his study made from the new self-twisting yarn – but not even he was told of the new process. Finally, after feeding thousands of metres of fabric into commercial outlets, CSIRO revealed its machine to the public in 1970. It was smaller, quieter, used less power, and spun wool 12 times faster than anything on the planet. By 1976, more than 1,600 machines had been exported & Australian wool was once again competitive with synthetics, breathing new life into one of Australia’s greatest industries, & securing wool industry jobs for generations yet to come. The following decade, we developed ‘Sirospun’ to spin and twist yarns in one operation, cutting costs by 40%. And it still isn’t over – as you’ll see later today. Australia’s history shows we have a rich heritage of innovation – so why have we self-twisted this yarn? Why are we more comfortable adopting other people’s innovation than investing in our own? Maybe it’s complacence bred from our world record economic growth; or maybe we’ve become sceptical about the value of innovation. Whatever the cause, Australians don’t look to science for solutions the way they used to anymore. And what’s wrong with that, I hear you ask. Why should we risk money inventing things here when we can ride on the coattails of other countries who do it better anyway? The Library at Alexandria, was lauded as a citadel of scientific revelation in its day. “The scientists never grasped the potential of machines to free people. “The great intellectual achievements of antiquity had few immediate practical applications. But after the flames burned out, and the ashes were scattered to the four winds – so too Alexandria, the greatest city the world had seen – was nothing, no hope, no future – gone, in a moment of madness. I heard the story of Alexandria, when I was a kid in primary school, & it gave me a profound sense of loss, until someone inspired me once more. It was my science teacher Sally Kerwin who made me love Physics. Cast your own minds back – I bet each of you remembers a teacher who inspired you, who changed the way you saw the world, who lit a spark of curiosity that still sparkles today. When I interned at CSIRO in 1984, my supervisor, John McAllan taught me: if you don’t deliver it, you haven’t really done it. Science innovation is different to other definitions of innovation – it creates new value that grows the economy – it’s literally the gift that keeps on giving. When I saw the deep impact CSIRO’s science was having on industry, it gave me a sense of the higher purpose of science to transform lives. It fired my conviction that science should never be hidden from the people, as it was in Alexandria, but instead, a visible part of making life better. It was a lesson I’d learn over and over again. My PhD advisor Jim Piper taught me that science solves problems. And thank you Jim, for being an inspiration, and for being here today. Later, my PhD examiner at Stanford, Bob Byer taught me scientists create companies. But fewer students are following that passion into university, and fewer still into their careers. That last lesson – that science creates companies – isn’t one we teach here in Australia. I lived that lesson for 26 years, commercialising science in Silicon Valley. The invention that got me hooked on founding companies was the world’s first solid-state green laser to cure blindness in diabetics. Our product was so unique, so high value, enabled by science solving an impossible problem that we could afford to manufacture it domestically, driving local jobs, and economic growth. Innovation is about highest value not lowest price, lowest price is a race to the bottom. Silicon Valley’s foundation was the silicon chip, the science that created Intel. Intel manufactured domestically, retrained automotive and white goods workers and created massive economic value. Scientists create companies; Science creates Industries; Industries create the jobs of the future. Then Intel expanded to Israel, and laid the foundation for Israel’s own innovation ecosystem. Science created thriving ecosystems that drove platforms of prosperity for generations. In Australia, we don’t have that ecosystem… not yet. But CSIRO can do for Australia what Intel did for Silicon Valley and Israel. I’m not saying we should copy other country’s innovation, that’s not very innovative. We have our own potential, our own strengths, and our own opportunities – Australia will be its own, unique ecosystem. But as our traditional Australian industries are disrupted, we must not allow other countries to seize the opportunities we have at our fingertips. The world is racing to turn their science into solutions, if we don’t keep up, we will lose our place in the world. I said we were writing a new chapter for CSIRO – it’s about three changes: speed, vision, and reinvention. First speed – because we are in an innovation race – we’re increasing speed through two new programs, with support from the National Innovation and Science Agenda. Two years ago, we created the national science accelerator, called ON. ON teaches Australian scientists how to build a bridge from lab bench to customer. It’s designed to take the best ideas from the whole Australian research sector out into market, speeding up their ability to make a difference in people’s lives. More than 200 teams, from 30 institutions, have taken their benchtop breakthroughs to beta concepts. It brings the entire research sector closer to Australian industry – aiming squarely at our ranking as one of the lowest collaborating nations in the OECD. A polymer you spray onto soil to lock in moisture and fertiliser for crops, while reducing evaporation and nutrient run-off into nearby bodies of water… like the Great Barrier Reef. It’s called Transpirational, from growing melons in Finley, NSW, to tomatoes Echuca, Victoria, Transpirational is transforming agriculture. Sedimentary run-off is the most consistent threat to the Great Barrier Reef, so we care a lot about it. There’s a livestock feed supplement made from seaweed that’s lower cost and more nutritious, and reduces methane emissions from cattle. It’s called FutureFeed, and it’s going to really help beef production and reduce our national emissions. And there’s a facial recognition technology that identifies when non-verbal patients are in pain. It’s called ePat, and it accelerated so fast, it’s already delivered product to market and exited on the ASX. These are just three examples out of 200 teams delivering Australia’s brilliant science into the hands of real people where it can solve real problems. And they’re creating some of the jobs of the future, in AgTech, eco-farming and MedTech. But we also know that in Australia, science is perceived as a risky investment. That’s why last week we launched Main Sequence Ventures, the national Innovation Fund, also created by NISA. The Fund is designed to bridge the challenges that many deep science ideas face when starting up. It will support new start-ups, and existing SMEs engaged in the translation of science from all Australian Universities, once again, strengthening our national innovation ecosystem. The Fund will back great Australian science – because sScience creates new industries, new companies and new jobs. Very appropriately the Fund includes money created by another Australian innovation, WiFi. Like WiFi, the name of the Fund comes from space science. Few stars make it to the Main Sequence, but when they do, they burn longer and brighter, and nurture growth for all around them. Growth of Australia’s own, unique innovation strengths – a lot like that shed, out the back in Geelong. Maxwell MRI is using Artificial Intelligence to detect prostate cancer. Again, we can see here the industries of the future: quantum computing, the internet of things, and better healthcare through Artificial Intelligence. So with ON taking Australian research from benchtop to beta; and Main Sequence Ventures funding the jump from beta to buyer; CSIRO is speeding up the creation the industries of the future. The second change I want to talk about is market vision; a fundamental shift from science push, to market pull. Companies like Intel had a vision of computers that others couldn’t see because it was impossible, but science makes the impossible, possible. So Intel used science to make their vision happen. We have a market vision for Australia’s future, one that’s already beginning to deliver. To deepen the connection between our science and the needs of industry, over the past 12 months we’ve developed a series of Industry Roadmaps, in partnership with Industry Growth Centres. They pinpoint Australia’s opportunities to transform our major industries with science, and there’s a common thread running through them – sometimes it’s self-twisting wool, sometimes carbon fibre. Commodities compete on price – unique products compete on value. In the past, we’ve unleashed our science on the world as an idea, undeveloped like a raw material dug from the ground. And much like our mineral wealth, which we’ve dug up and shipped away, our ideas have realised their potential elsewhere, creating value, jobs and opportunity in other countries. For decades, we’ve made money exporting mineral sands, worth pennies per pound. It’s time to shift our focus to creating our own high value products. We started with a small step, by turning sand into titanium ink for 3D printing. Then we thought bigger, and created this replacement sternum that saved a young woman in NYC – a first for the US. And in so doing, propelling a small Aussie SME called Anatomics to the world stage. We’ve seen where this story leads before: Intel turned sand, into a unique high value material, silicon. With the right market vision, science is the fulcrum to pivot our economy. After reinventing wool, we partnered with another Aussie SME called Textor to invent a novel way to weave paper in three dimensions. The novel process required a completely new approach to manufacturing, but the resulting paper was so absorbent, it’s now being used in nappies around the world by Kimberly Clarke. But that’s still not the end of the story, because next they looked at new kind of fibre. Carbon fibre is a next generation material, delivering ultra-low weight, superb stiffness, and high conductivity. It’s being used in everything from bicycles and tennis rackets; to wind turbine blades; right through to my personal favourite: aviation and space. In fact, we’ve already helped yet another Aussie SME Carbon Revolution to develop carbon fibre wheels, for the latest model Ford Mustang. But, carbon fibre is only made by a handful of manufacturers around the world, each of whom hold their own secret, patented recipe. In partnership with Deakin University, CSIRO has cracked the carbon fibre code. Today, I’m thrilled to reveal one of the first pieces of carbon fibre made from scratch in Australia, from Australia’s own top secret recipe. Just as their forebears created new industries and jobs in wool with their invention, the CSIRO and Deakin team has taken the first step towards reinventing generations of new jobs in carbon fibre manufacturing here in Australia – not very far, in fact, from that historic shed in Geelong. It’s also worth noting that our Advanced Manufacturing Industry Roadmap has mapped the path for carbon fibre in Australia over the coming years, and the future is in good shape. So we’re picking up the pace with ON and Main Sequence Ventures, and we’re delivering higher value and vision to industry. The third and final change I want to talk about today is the power of science to re-invent. It inspires us to take leaps of faith into the future, well beyond what seems possible today. It inspired me as a kid in primary school, watching the Moon landing. And it inspires kids in schools today, entranced by our Pluto fly-by or the Cassini crash into Saturn – all three of which, were received, by the way, by Australia’s national science agency right here in the ACT, as part of our 50 year partnership with NASA. So to ensure our reach exceeds our gaze, we’ve created six Future Science Platforms, or FSPs, each closely aligned with the market vision we created for re-inventing each of Australia’s major industries. Now I could tell you about Environomics, or Synthetic Biology or Deep Earth Imaging or Digiscape or Probing Biosystems or Active integrated matter – but we’ll never get to your questions if I go into that kind of detail. So suffice it to say the 60 or so scientists we’re hired to realise these ambitions are making outstanding progress. Instead, let me do you one better and tell you about two new FSPs that we haven’t even announced yet, which are designed to create industries that don’t even exist yet. The first is Hydrogen Energy. We invented the Hydrogen “cracker” – it creates hydrogen from ammonia. Ammonia is already transported all around the world using existing liquid fuel infrastructure, so it’s faster in every sense than charging an electric car. In May, we launched a project with BOC, Hyundai and Toyota to turn ammonia, into fuel for cars. Not only is hydrogen a renewable energy source, but it’s also energy storage, something we need to stabilise the grid as we introduce more renewables. Those same renewables – like solar energy – can produce Hydrogen directly, enabling Aussie sunshine to be exported around the world as a renewable liquid energy. The second new industry is Precision Health – creating a healthier future for all Australians. We all know Australia has exceptional medical research, but it is largely focused on treatment rather than prevention. We’re creating new foods and new diagnostics to reduce diabetes, obesity, infectious diseases and certain cancers. In fact, we’ve demonstrated the first scientific proof that data saves lives. We developed new software tools to accurately forecast demand and help ensure access to emergency care and a hospital bed, and we’re currently rolling this out in Queensland hospitals. The tools have 90% accuracy, and if the entire country used the tool, we could save a huge $23 million from the health budget every year. In partnership with universities and industry, our Future Science Platforms are imagining – and creating – the industries of the future, that will grow the jobs of the future, that we and our children need. We’ll have more to share tomorrow about our $5 million investment in these two new FSPs later this week. Is Reinventing industries to deliver the jobs of the future. I hope you’re also a little more optimistic about Australia’s future now that you’ve had a glimpse of these ephemeral “jobs of the future”. How our children’s imaginations will turn the commodities of old into custom aerospace or electric car components, or unique foods that extend life itself, or export 100% renewable clean fuels to power the engine of the world. But my biggest hope is that as a nation, we will start to back ourselves again – because if we don’t, we can’t possibly succeed in tomorrow’s world. We may have grown complacent, and we may be a little sceptical about innovation in an era of automation. That might be what they thought in Alexandria, but we’ve come a long way since then. CSIRO has opened the doors of the library. You don’t need a library card, you don’t even need to be quiet – in fact we want to hear you loud and clear. Your national science agency is exactly that: Yours. We’re here to make science deliver the jobs of the future that you and all Australians need, today and in the future, regardless of skills, expertise, or background. If we don’t back our own abilities, we will see these industries – and the jobs they create – being developed in other countries, at our expense. In times of change, it’s easy to forget that we’ve been here before. We’ve reinvented old industries, and we’ve created new ones. We’ve woven our own success and we’ve spun out new industries – and not just the ones relating to fibre. We can – we must – we will – do it again. You can watch the live recording via ABC here. Find out more about our carbon fibre breakthrough. we have allowed the extraction of minerals of many kinds to be exported to the world with the ‘satisfaction’ of giving jobs to a fortunate number of Australians, only a small amount of the ‘satisfaction’ resulted in any manufacture of support machinery, and the companies are mostly foreign owned, paying very little to the local coffers. I hope the heart warming address by Dr Marshall will give Australia the impetus needed. When I retired from CSIRO in 2000, I was disheartened at the direction the organisation was taking, when it seemed that only research projects with a clear and short-term marketable product were being pursued. 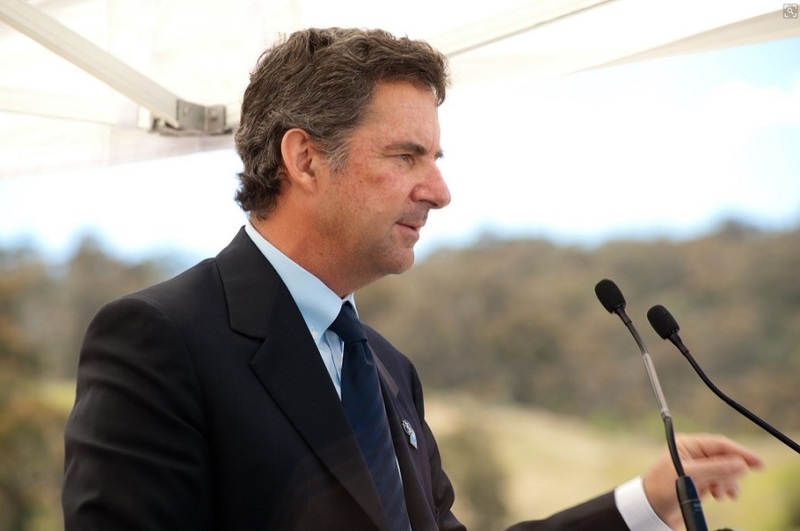 Reading Marshall’s address, I am greatly heartened and reassured that the much-loved CSIRO that I worked in for all those years is once again at the forefront of scientific research and technological innovation. Having said that, however, I am still greatly concerned at the way the long-standing, important and greatly respected atmoshpheric and marine monitoring prolects were decimated. It is not convincing to say that the time for monitoring is over; we will only know where we are if we are informed by on-going data collection.